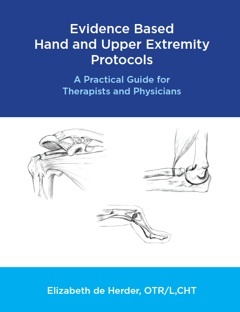 INTRODUCTORY OFFER - FREE SHIPPING (USA) Evidence Based Hand and Upper Extremity Protocols is a comprehensive manual with over 70 therapy treatment protocols for the most common surgical and nonsurgical diagnoses of the upper extremity. This manual is in a week-by-week format that is easy to use. Each protocol is based on the most current medical evidence and is uniformly outlined with indications, contraindications, recommended weekly therapy visits, and surgical outcome limitations. Many of the diagnoses have more than one protocol to choose from to appeal to all physicians. this is a fantastic clinical resource. I liked it so much I ordered one for each clinic. This book is well written and easy to understand. Thanks for making this available to us.